If you’ve always wanted to see Jean-Luc Picard swear or Commander William Riker chase an ensign down a hallway, today is your lucky day. This new video is a gag reel from season 7 of Star Trek: The Next Generation and gives you a different kind of look at the normally so prim and proper crew of the Starship Enterprise. Apparently things were not always so serious on set. Coming from UPROXX, this footage is just a part of the bonus features that will arrive with the Blu-ray release of the seventh and final season of The Next Generation. The whole video is less than a minute long, but it’s totally worth it just to see Patrick Stewart curse as Gates McFadden’s Dr. Beverly Crusher stomp on his foot. And it just drives home the idea you probably already have in your head that the cast and crew had a really good time making The Next Generation. They always look like they’re having so much fun. Yesterday humanity made history by successfully landing a spacecraft on a comet for the first time ever, thus bringing the scenario from Armageddon one step closer to becoming a reality. The European Space Agency’s Rosetta mission, which has been going on for the better part of a decade now, approached Comet 67P and unleashed its Philae lander, which touched down and started transmitting information back to Earth. It’s a momentous occasion for the species, and this ball of rock and ice hurtling through space is now the seventh heavenly body we’ve touched. We know this is a big form flying around out there, but it all sounds so abstract and can be hard to visualize. 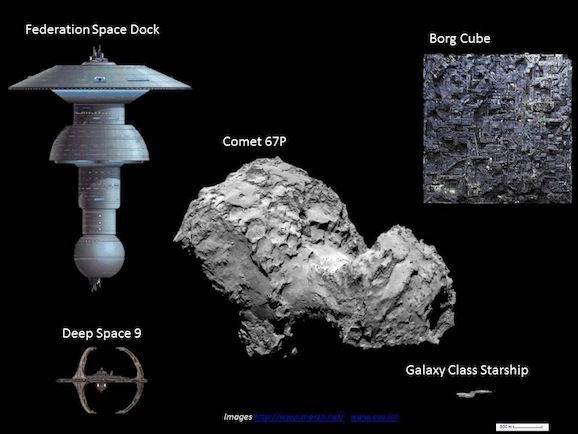 Fortunately for us, some folks out there have taken it upon themselves to put Comet 67P into a context we, as science fiction fans, can wrap our heads around. Over at Nerdist, they took dimensions of the comet and compared it to the specs of various elements of popular science fiction, which, again, gives those of us familiar with such things a new way to think about this that makes sense to our pop culture addled brains. For instance, if you ask yourself, well, how does this compare to a Galaxy Class Starship from Star Trek? This handy image shows you just how it compares. It’s also much bigger than Deep Space 9, but is roughly equivalent to both the Borg Cube and a Federation Space Dock. So now you can picture just how big this thing is. Christopher Nolan’s Interstellar is finally here, and though many in the audience are finding it wanting in certain areas, there’s no denying that the portions in space are truly, utterly breathtaking. But his film is not the only movie to ever take audiences beyond the Earth’s atmosphere and into the depths of space, far from it. The journey to the stars and beyond is a well-worn, time-honored tradition in film, as you can see in this awesome supercut of cinematic space travel. Called “Reach for the Stars,” which admittedly sounds like a motivational video or a mid-1980s Star Search knock off, this compilation comes from over at Fandango. It collects space footage from 20 movies, some you expect—it’s a bit Interstellar heavy, and the Star Trek franchise is well represented—and others that you would never guess. I had no idea that they went to space in The Nutty Professor 2. Star Trek: Generations definitely wasn’t the franchise’s finest hour, but it did have the major selling point of getting to see Kirk share an adventure with the Next Generation crew. 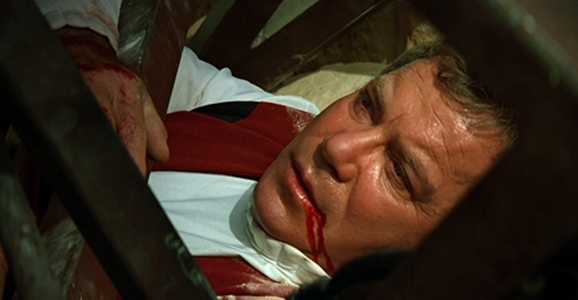 Unfortunately for Kirk, that adventure ended with his death after he got a freaking bridge dropped on him. One of the two men responsible for writing that death scene was Ronald D. Moore, who went on to bring us the Battlestar Galactica reboot and Starz’s Outlander adaptation. In a new interview with Collider, Moore shares his thoughts about what it was like to be tasked with killing off a character he’d grown up idolizing. It was difficult, and yet I was very eager to do it. It was a really odd thing. I really wanted to do that story. I really wanted to write the death of Captain Kirk. I really wanted to do it in the movie. I remember writing the scene with Brannon [Braga], my writing partner, at the time. When I said, ‘And Kirk dies,’ I wept. It was very emotional and very strange, in the moment and all the way through the process. I’d read it in the script and I’d always be struck by what I’d just done and what we were doing, and that this was my childhood hero and I was writing his death. Even then, I didn’t quite know what to make of it. I was mystified by why I was doing it, why I was so driven to do it, and why it was affecting me like it was. I still don’t know what it means. It’s a strange singular experience. I don’t even know anyone to talk to about it because I don’t know anyone who’s had that experience. For fans who got hooked on Star Trek’s original run on NBC from 1966 – 1969, the sting of cancellation left them with many dark years before Gene Roddenberry’s creation rose from its ashes as 1979’s Star Trek: The Motion Picture. And this was before the internet, so keeping track of any glimmers of a future for Trek required you to keep up with fan magazines, gossip at conventions, or kidnap and interrogate Roddenberry inside a windowless van with a shirtless Captain Kirk emblazoned on the side. But if you did one of those things, you might have heard tell of Star Trek: Phase II. Before The Motion Picture was a thing, Phase II was set to pick up the Enterprise’s story with a second five-year mission. It fell by the wayside along with plans for a proposed “Paramount Television Service,” but Phase II’s passing left many relics behind, including this concept art by Mike Minor. Halloween is coming, and while there’s always a lot of talk about potentially awesome costume designs, every year people don and assortment of truly questionable outfits. To help steer your holiday in the right direction, we’ve compiled a list of sci-fi themes you may want to steer away from to ensure a smooth, hassle free night of handing out candy and getting wasted.